Spring break is next week. Spring break week begins on Monday, March 28th and ends on Friday, April 1st. School will resume on Monday, April 4th. Please note that there will not be a District blog post next week. Regular weekly blog posts will resume on Wednesday, April 6 th. 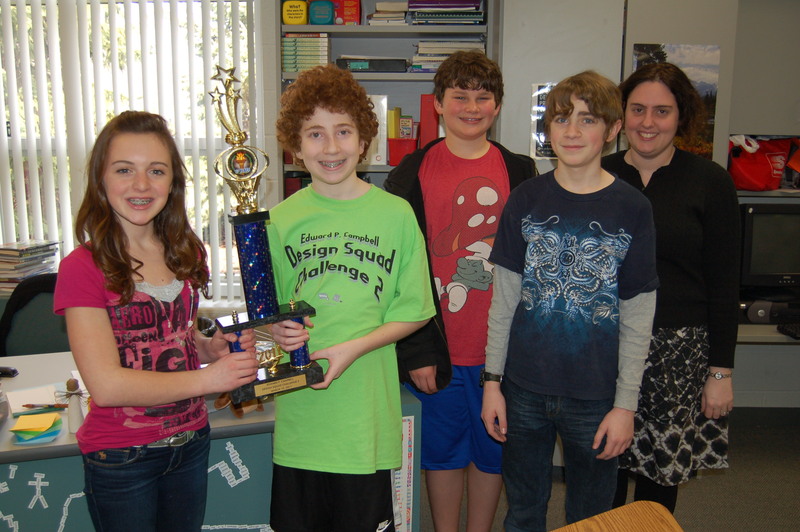 Winning Design Team members (from L to R) Morgan Ashton, Zach Buchta, Jacob Conder and Stephen Miller pose for a photo with their first place trophy and team advisor Mrs. Anne Miskimins (far right). 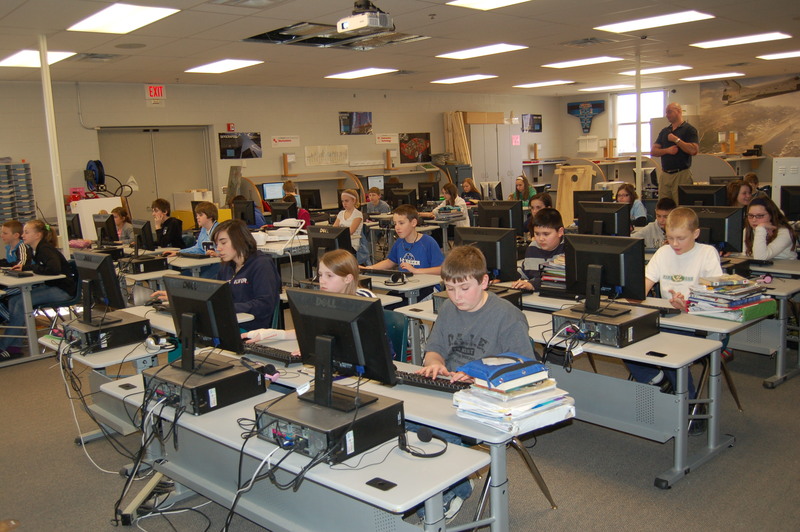 Last Saturday, March 19th, 7th and 8th graders from twelve area schools came together to compete in WVIZ’s Edward P. Campbell Design Squad Challenge, sponsored by ArcelorMittal. Seventh graders Morgan Ashton, Zach Buchta, Jacob Conder and Stephen Miller represented Olmsted Falls Middle School in this competition. Student teams were presented with three engineering challenges. The students from OFMS rose to the challenge each time by exhibiting phenomenal teamwork, excellent collaboration skills, creativity, and knowledge of basic engineering and scientific concepts. The students had a lot of fun and emerged as the winners of this year’s competition! 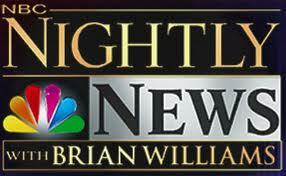 Look for the OFMS team displaying their awesome rocketry skills on an upcoming episode of “NewsDepth” on WVIZ. What is a P.I. Levy? Why does our District need this type of revenue stream? What would these funds be used for? How is it possible that passage of the P.I. Levy on May 3rd will NOT raise my taxes? Ask questions. Get Answers. Be informed. Please join Superintendent Dr. Todd Hoadley for a brief presentation TONIGHT, WEDNESDAY, MARCH 23rd at 7:00 p.m. in the High School Library Media Center. Additionally, if any parent or resident is interested in hosting an informational, in-home “coffee talk” for a group of 10-15 friends, neighbors and/or family members, please contact Superintendent Dr. Todd Hoadley to schedule. These in-home presentations feature a 15 minute Power Point and an opportunity for Q & A with a District Administrator or School Board member. Beginning next week, the Pride In Olmsted Schools committee will have yard signs available to help spread the word about the 2.8 Mill P.I. Levy – which will not raise school taxes for residents. To reserve your yard sign today, please e-mail prideinolmstedschools@gmail.com with your name and street address. A sign will be delivered and placed in your yard sometime during the spring break recess. Thank you in advance for your support of this critical P.I. levy! 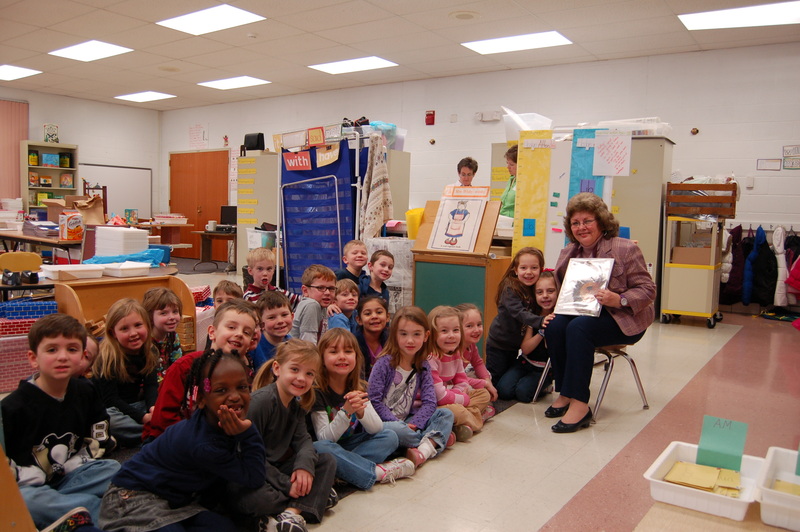 Last week was Right To Read Week and what a week it was for the students of the ECC and Falls-Lenox! 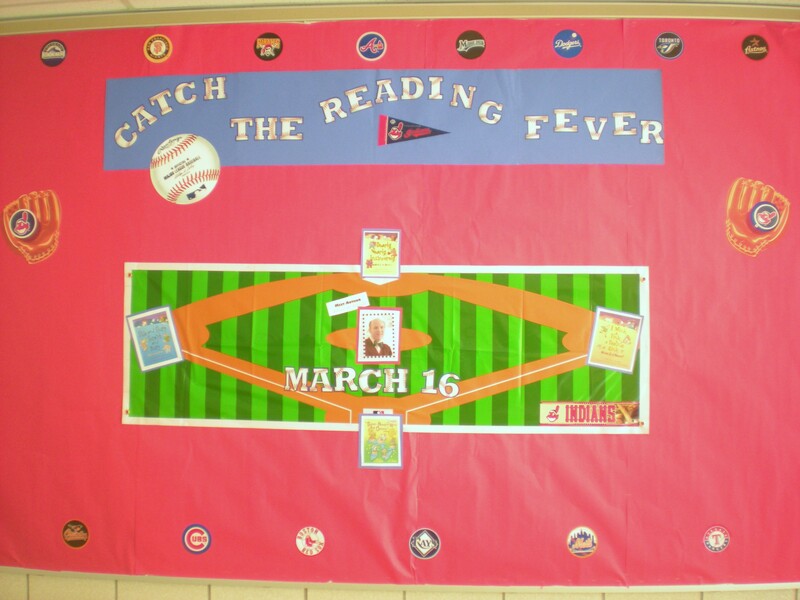 Students at the ECC became “Buggy About Books,” while the students over at Falls-Lenox were asked to “Catch the Reading Fever” with a baseball-themed week. Students were treated to guest readers, an author visit from Brian P. Cleary at Falls-Lenox, and an assembly from storyteller Mr. G (Jonathan Graham) at the ECC. All students also received books to take home and keep. Assemblies and books were funded by the PTA. At both schools students were challenged to read extra minutes each day. Since both schools reached their reading goals, Mr. Roseberry, principal at Falls-Lenox, received a pie in the face, and Dr. Lloyd, from the ECC, had to eat a worm! A special thanks to the Library Media staff for putting together all the activities for Right To Read Week for both schools. 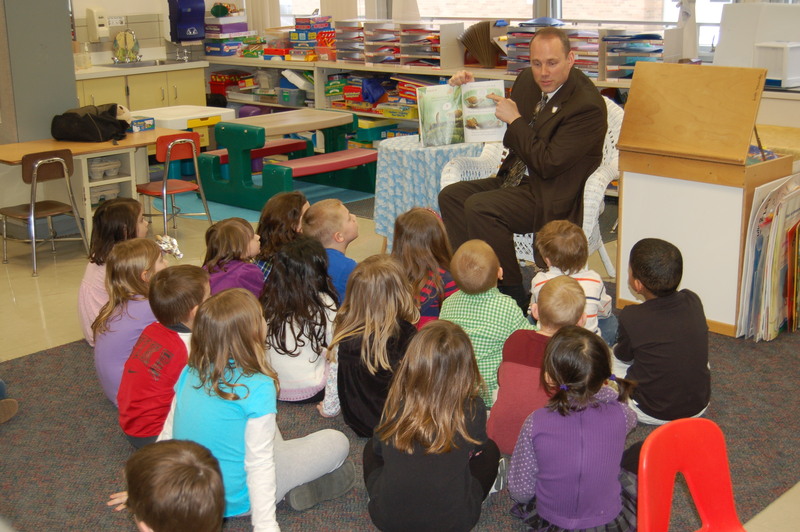 Please click here to view photos of Right To Read Week activities at ECC. 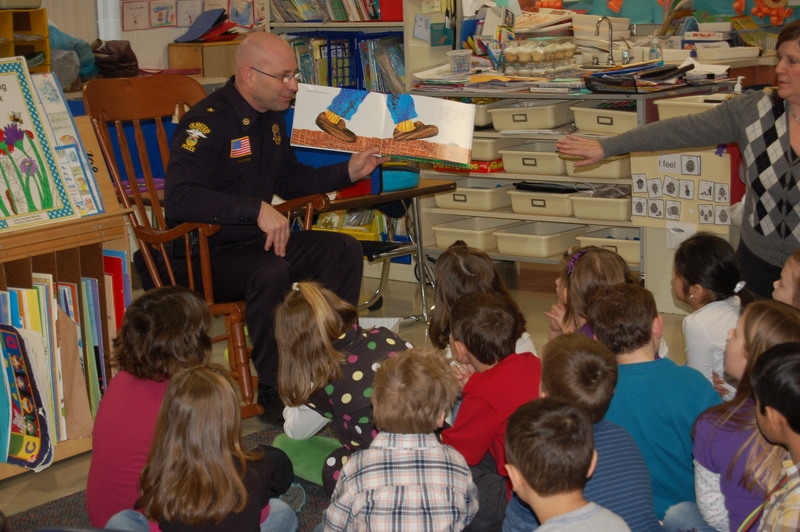 Please click here to view photos of Right to Read Week activities at Falls-Lenox. 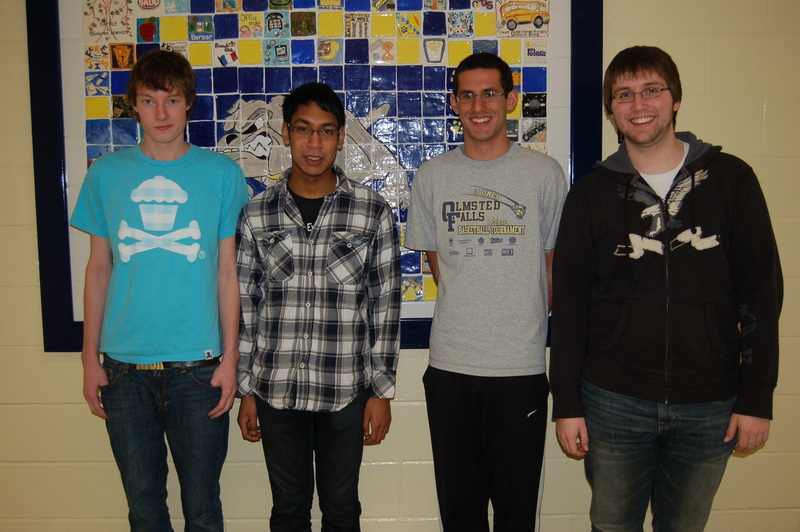 Congratulations to Jim Coury, Mike Coury, Brad Sevcik and Sohan Vartak who qualified to compete in the Ohio High School Mathematics Invitational Olympiad based on their exemplary performance on the OCTM Mathematics Tournament Contest. The OFHS team finished 2nd overall, just one point behind Brecksville-Broadview Heights High School. OFHS ranked tied for 9th out of 98 schools in the state taking the exam (4th for schools of comparable size). 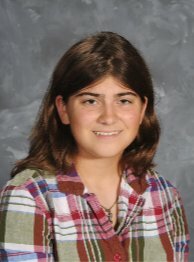 Congratulations to Olmsted Falls High School student Haleigh Sanders on making it into the group of top ten finalists in the third annual Maltz Museum of Jewish Heritage Stop the Hate: Youth Speak Out essay contest. This year, more than 1,700 students from 139 schools entered the Stop the Hate: Youth Speak Out essay contest, which invites students to share their solutions to stop hatred and discrimination. Haleigh is now among just 10 of those students who have risen to the top and will now compete for $100,000 in scholarship prizes at an Ohio college or university. These 10 student finalists were narrowed down from 26 semi-finalists after a panel of select judges read their essays. Judges this year include Civil Rights Attorney and CNN Legal Analyst Avery Friedman, The Plain Dealer Editor Debra Adams Simmons and Grand Prize “Stop the Hate” Scholarship Winner 2010 Andrea Bestor among others. 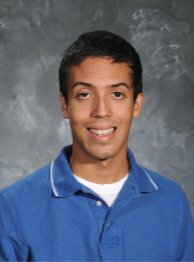 These finalists will compete for three college scholarships by giving oral presentations at the awards ceremony on April 10 at Severance Hall. Congratulations again to Haleigh and best of luck at Severance Hall! Thanks to the support of the Olmsted community, last weekend’s DanceItUp4KidsHealth event was a resounding success! The kids had a wonderful time and close to $3,000 was raised for the ECC playground, the Autism Society of Greater Cleveland, and the Asthma & Allergy Foundations of America. To view photos from the Dance It Up For Kids Health Event, please click here. Special thanks to all the sponsors, donors, businesses, volunteers and participants who helped with the event – and especially all the students, including the MS Student Council, Natalie Ferrini, Nick Romanowski, members of the HS Key and Builders’ Clubs, and others. Congratulations to our top marathon dancers – Caleb Sherman who obtained 21 pledges to dance and Nicole Sloan who raised the most money! Lake Erie Fishing Charter: This is a 3-4 hour charter for up to 3 people sponsored by Blue Dolphin Charters. Your captain is a professional, award-winning walleye fisherman who has been on TV and in magazines. Prize value of $400. Installed Hard Surface Flooring: You will receive your choice of either a hardwood or laminate floor installed for a 12×12 foot room( approx. size) sponsored by FigzFlors. (Removal of old flooring and other extra services not included.) Prize value of approx. $850. “Date Night” Hotel Package: You will receive a one night weekend stay at the Radisson Hotel, Airport with breakfast for two included and two Akron Symphony Tickets (they don’t have to be used on the same night). Prize value of approx. $200. At $2 each or 3/$5, any one of these prizes would make great Mother’s or Father’s Day gifts! If you’d like to purchase tickets, checks should be made out to the Olmsted Falls PTA Council and sent to the ECC, 7105 Fitch Road, Olmsted Falls ATTN: Darla. Please make sure you include your name and phone number and designate which raffle/s you want to enter. The deadline to purchase tickets is April 12th. Winners will be drawn on April 13th and posted on the district’s blog. 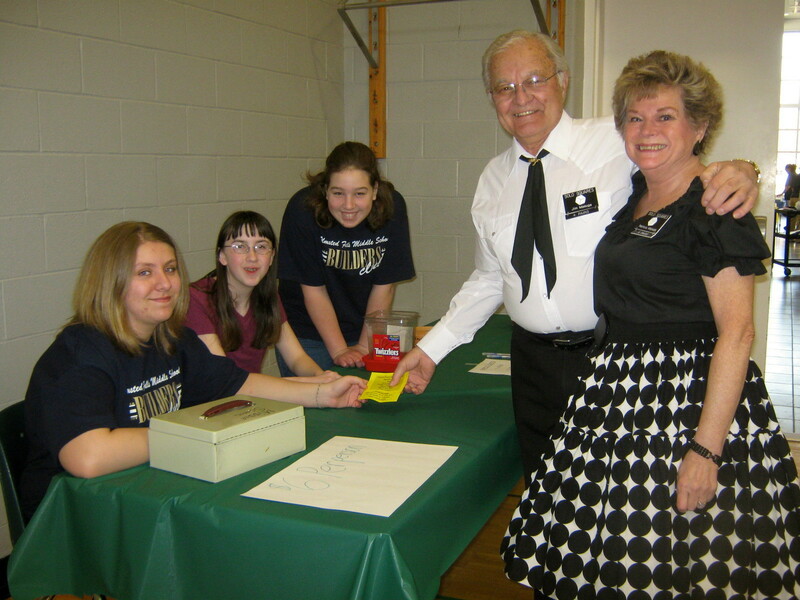 Last Sunday, March 20th, Olmsted Falls Middle School Builders Club held a rather pleasurable square dance. The square dance invited square dancers from around the area to get together and have a great time. Builders Club provided refreshments and snacks for the dancers, including cookies, coffee, cupcakes, chips, and many others. Builders Club raised money at the dance by holding a 50/50 raffle and a Chinese raffle. Items like gift baskets, gift cards, jewelry, and photo frames were raffled off in the Chinese raffle. The 50/50 raffle was very successful as well. Overall, the square dance was a huge success, the dancers left satisfied and Builders Club raised $660 for their three charities: Christians in Action, Berea Animal Shelter, and the Berea Children’s Home. 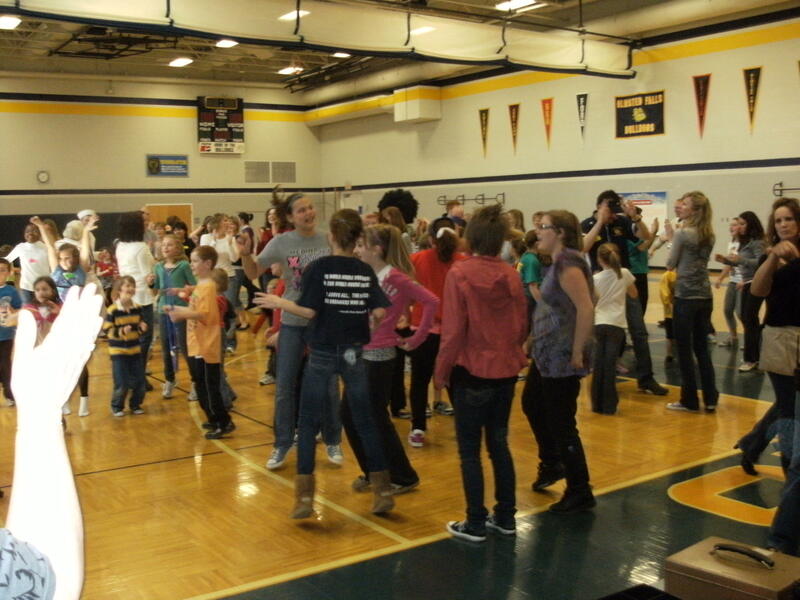 For additional photos of the Builders Club Square Dance, please click here. The annual High School May Art Show is scheduled for Friday, May 20th. In addition to the large collection of student artwork, the show also showcases a section of artwork created by alumni, faculty, staff and community members. High School Art Teacher Mariel Krakowiak is currently seeking entries for this year’s show. Please click here for the official entry form which features additional information. Deadline for completed entry forms is Friday, May 13. ﻿﻿﻿﻿﻿Prior to the March 30th Career Fair (see next event item), Polaris will host free Resume Writing Workshops TOMORROW, THURSDAY, MARCH 24th from 1:00 to 3:00 p.m. and 5:00 to 7:00 p.m. These sessions will provide timely resume information and allow participants to “hit the ground running” on March 30. To register for the Workshop, visit www.polaris.edu or call (440) 891-7600. For additional information, contact Tony Schweppe (Employment Connection) 216-664-3431 or Chris Anderson (Polaris Career Center) 440-891-7607 or visit www.polaris.edu. EMPLOYERS, JOB SEEKERS INVITED TO 2011 POLARIS/WESTSHORE CAREER FAIR – NEXT WEDNESDAY, MARCH 30th, from 10:00 a.m. – 2:00 p.m. – Polaris partner employers and local job seekers are invited to participate in the ﻿﻿﻿2011 Polaris/Westshore Center Career Fair which will be held at the Polaris Career Center on Wednesday, March 30, 2011, from 10:00 a.m. to 2:00 p.m. This free event, designed to foster a competitive and productive workforce in Northeast Ohio, will provide a vital link between employers and potential employees – the career fair promises to attract 100 companies and more than 1,200 job seekers. In addition, local agencies and representatives from Polaris will be on hand providing access to educational resources, financial aid information and much more. Employers must register in advance. Set-up on March 30 will take place from 8:00 to 9:30 a.m. followed by a brief welcome program. Job seekers are strongly encouraged to pre-register at this web address to gain priority entry into the event. CARNIVAL FOR A CURE – FRIDAY, APRIL 15TH from 6-9 p.m. at Falls-Lenox Primary School — All students and families are invited to attend this fun family event to support American Cancer Society Relay for Life. (Students MUST be accompanied by an adult!) Come to our Carnival for a Cure! Have fun, play games, walk for a cure, and challenge your principal! We will offer $2 dinners! Walk a mile or more and earn your lap beads! Get your face painted or your fortune read! Come make a difference and enjoy the evening with your family, your friends, and your teachers! $5 PER STUDENT (Adults: Donations Accepted). Please click here to download flyer / form. Governor John Kasich released his first two-year biennium budget yesterday, providing school districts across the state with the information they’ve been waiting for to confirm how their financial forecasts of anticipated cuts match up with reality. Since last spring, school districts have been advised to brace for cuts in their state funding of up to 30%. Olmsted Falls City Schools, and many surrounding districts, have been budgeting for a cut of 10% in their five-year forecasts. While it will take a little time to determine the exact impact on our District, a preliminary review of the cuts seem to reveal that District projections (of 10%) are relatively close to actual. We will continue to share information about the impact of this new state budget on our District as it becomes available. In the meantime, we invite you to click this link to review an article that appeared yesterday about school funding reductions in the Governor’s budget. It is clear that Olmsted Falls City Schools, will have to continue to operate in an arena of decreasing budgets. Passage of the 2.8 Mill P.I. Levy on May 3, 2011- which WILL NOT RAISE THE CURRENT LEVEL OF SCHOOL TAXES – will be critical to helping our District stretch existing dollars and have the funds available to address facility maintenance issues. Literacy is among the most critical components to student success. 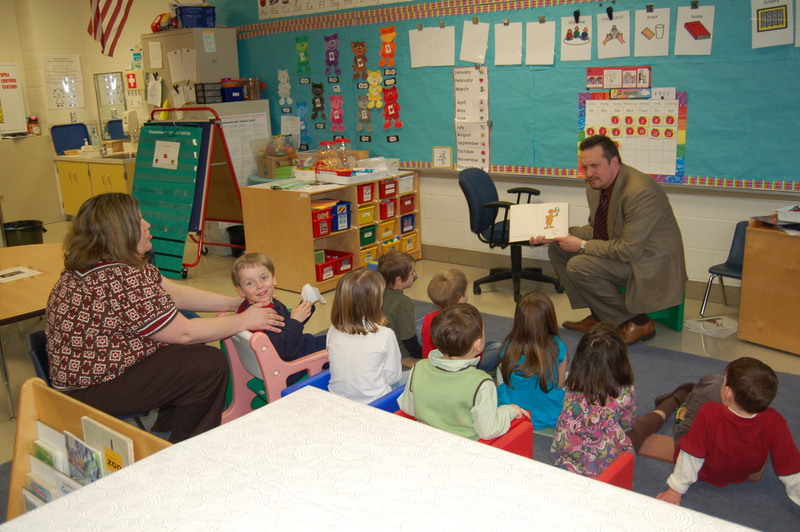 Instilling and encouraging a love of reading at a young age is an important priority in Olmsted Falls School District. 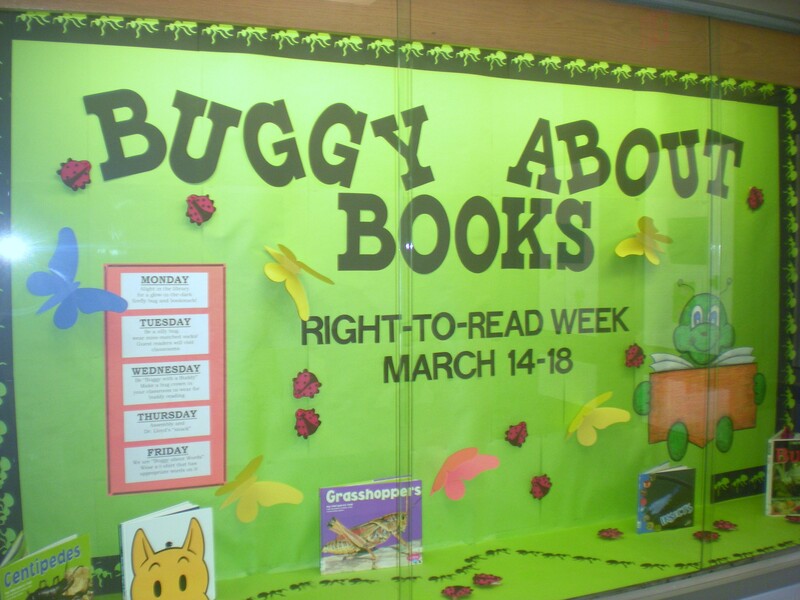 Each year, with the help of PTA, students across the District participate in a week-long celebration of reading during “Right To Read Week.” This year’s theme for Falls-Lenox and the ECC is “Buggy About Books” and a number of special activities are taking place all week long. Earlier this week, a series of guest readers visited the ECC to read some of their favorite books to our little bulldogs. Special assemblies are also planned. Please be sure to check next week’s blog for a wrap-up report and links to photo galleries featuring images from activities and events throughout the week. PRIDE COMMITTEE LAUNCHES WEBSITE TO HELP INFORM COMMUNITY ABOUT P.I. In light of the new state budget, passage of the 2.8 Mill P.I. Levy on May 3rd is even more urgent. Ensuring that every parent and resident has the information they need to understand this important vote and make an informed decision is a top priority. To that end, the Pride In Olmsted Schools Committee has launched a website containing detailed information on the upcoming P.I. Levy. Please visit www.prideinolmstedschools.org to be sure you have all of the facts, and get involved. The new website also features links to request yard signs in support of the P.I., and/or schedule an in-home “coffee talk” on the issue. (L to R) AP Scholar with Honor Award winners Nicholas Macek and Shom Mazumder, and AP Scholar Award winners Mike Coury and Scott Loeffler. 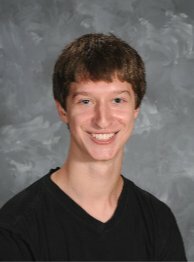 The College Board recognized four students from Olmsted Falls High School for their outstanding academic performance on Advanced Placement (AP) Exams. The College Board’s Advanced Placement Program provides academically prepared students with the opportunity to take rigorous college-level courses while still in high school, and to earn college credit, advanced placement, or both for successful performance on AP Exams. Only about 18% of the more than 1.8 million students worldwide who took AP Exams performed at a sufficiently high level to also earn an AP Scholar Award. 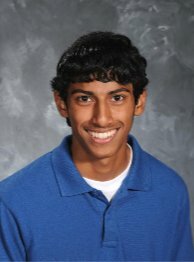 Congratulations to Nicholas Macek and Shom Mazumder for earning the AP Scholar with Honor Award, granted to students who receive an average score of at least 3.25 on all AP Exams taken, and scores of 3 or higher on four or more of these exams. 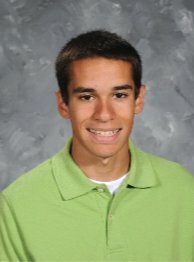 Congratulations to Mike Coury and Scott Loeffler on earning the AP Scholar Award, granted to students who receive scores of 3 or higher on three or more AP exams. In today’s technology age, providing students with the skills they need to stay safe is important. Each year, sixth grade students at Olmsted Falls Middle School participate in an internet safety unit sponsored by the FBI. Teacher Steve Kathrein facilitates the “FBI SOS Internet Safety” program in his classes. Schools throughout the country participating in this interactive unit about how to stay safe on-line compete with each other through a series of tests. 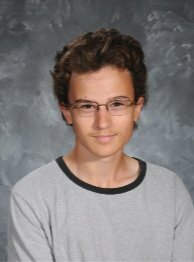 Mr. Kathrein’s students usually rank among the top 3 in the nation! Mr. Kathrein’s current sixth grade classes just received the news that they are currently ranked in 1st place in the entire nation following the group’s pre-test. If they hold this rank and score high on the post-test as well, they could receive a national trophy presented by two FBI field agents. Congratulations and good luck to our tech-savvy sixth graders as the competition wraps up later this month! CALLING ALL BULLDOG FAMILIES: “DANCE IT UP 4 KIDS HEALTH” IS THIS SATURDAY, MARCH 19TH – DON’T MISS OUT ON THE FUN! Family Oriented-PTA sponsored charity event to raise money to support children’s health! A few of our Special Guest Stars: “Disco” Dan Dame, OF Performing Arts Dance Troupe, Community Center’s Youth Dance Instructors, Members of the HS Football Team, Swing Dancers Christy & Bill Dorincot & students from OF schools! Dances are fun to serious & disco to hip-hop! Audience participation dances! Two ways to enter. Obtain pledges (forms in school offices) and you get into the event for free or you can donate $5 at the Marathon(must purchase event admission ticket). Prizes for most pledges and money raised. Hula Hoop & Limbo contests/prizes! Raffle Items include an Installed Hardwood Floor, a Lake Erie Fishing Charter & many other prizes donated by local businesses. Also, play some Carnival games & have a chance to win!! Meet with local businesses & organizations to discuss ways to help your family have fun and live a healthy life style! Lots of giveaways including free mini-manicures and eyebrow threading from A Time to Spa, and free blood pressure and blood sugar checks from Drug Mart Home Health. Come experience WII dance with your family! Come see the OF Fire Engine! The Ohio Graduation Test (OGT) is being administered this week. Students must pass all five sections of the test (Reading, Writing, Mathematics, Science and Citizenship) in order to receive an Olmsted Falls High School diploma. All sophomores are required to report to their assigned homeroom by 7:30 a.m. each day for testing. Please click here for additional information, including a list of assigned homerooms. Yearbook preparation is in full swing for the OFHS Publications staff. Not only is work being done on the upcoming 2010-2011 yearbooks, but the 2009-2010 book is still available for purchase. The books are $60 and can be purchased in the main office at the high school. 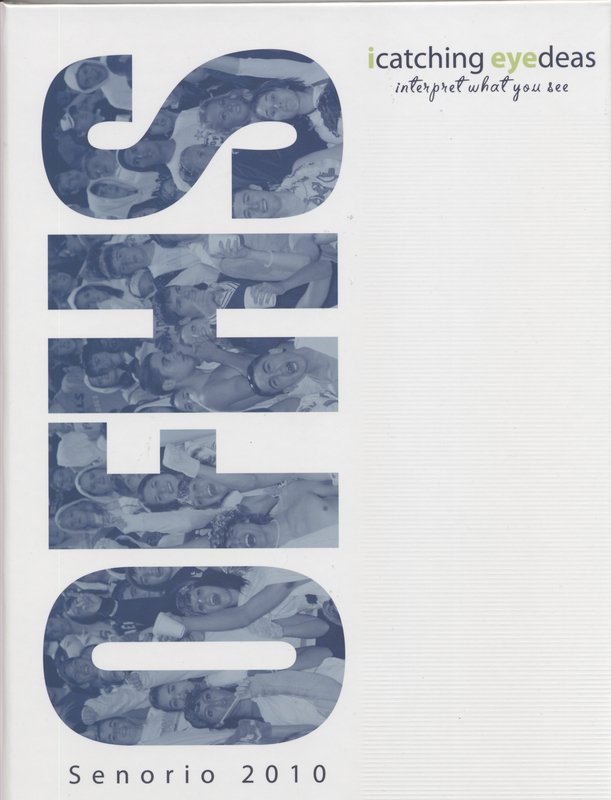 Presale of the 2010-2011 yearbooks is currently offered on http://www.jostens.com for a discounted price of $55, and the in-school presale will take place during the student lunch periods. Also, “Ads for Grads” can be purchased for your favorite student or team. These ads come in a variety of sizes and prices. The $10 discount for all ad sizes ends this Friday, March 18th. The deadline for “Ads for Grads” is April 21st. For more information, please email us at publications@ofcs.net or call Mr. John Gaba at 440-427-6050. The Olmsted Falls Academic Booster Club is still seeking Board members to join efforts for the 2011-2012 school year. The Academic Booster Club puts on the Annual Honors Banquet held at Baldwin-Wallace College each year. Any parents interested in getting involved are encouraged to contact Cindy Kelly at 440-235-0989 or cindykelly@ameritech.net for additional information. HIGH SCHOOL POST PROM 2011 COMMITTEE FUNDRAISER – WING NIGHT AT SLIM AND CHUBBY’S THIS SATURDAY, MARCH 19TH from 6:00 to 9:00 p.m. – Support OFHS Post Prom by enjoying “Wing Night” at Slim and Chubby’s located at 12492 Prospect Road in Strongsville on Saturday, March 19th from 6:00-9:00 p.m. $25 per person. Food, Raffle and Fun! ﻿﻿﻿﻿﻿EMPLOYERS, JOB SEEKERS INVITED TO 2011 POLARIS/WESTSHORE CAREER FAIR – Wednesday, March 30th, from 10:00 a.m. – 2:00 p.m. – Polaris partner employers and local job seekers are invited to participate in the ﻿﻿﻿2011 Polaris/Westshore Center Career Fair which will be held at the Polaris Career Center on Wednesday, March 30, 2011, from 10:00 a.m. to 2:00 p.m. This free event, designed to foster a competitive and productive workforce in Northeast Ohio, will provide a vital link between employers and potential employees – the career fair promises to attract 100 companies and more than 1,200 job seekers. In addition, local agencies and representatives from Polaris will be on hand providing access to educational resources, financial aid information and much more. Employers must click here to register online. Set-up on March 30 will take place from 8:00 to 9:30 a.m. followed by a brief welcome program. Job seekers are strongly encouraged to pre-register at this web address to gain priority entry into the event. Prior to the March 30 Career Fair, Polaris will host free Resume Writing Workshops on Thursday, March 24 from 1:00 to 3:00 p.m. and 5:00 to 7:00 p.m. These sessions will provide timely resume information and allow participants to “hit the ground running” on March 30. To register for the Workshop, visit www.polaris.edu or call (440) 891-7600. For additional information, contact Tony Schweppe (Employment Connection) 216-664-3431 or Chris Anderson (Polaris Career Center) 440-891-7607 or visit www.polaris.edu. For the first time, Olmsted Falls has won a state championship in Speech and Debate. Seniors Ben Brown and Eric Miranda went 10-1 in debate and won the state championship in Public Forum style debate at the Ohio High School Speech League (OHSSL) State Tournament held last weekend. The team also garnered 2nd and 3rd place awards with solid performances by Nick Macek and Shom Mazumder, who qualified for the final session of Student Congress. Nick won 2nd place and Shom won 3rd place. Shom Mazumder was also named Best Presiding Officer. Overall, the team finished 9th in the State – their first top ten finish at the state level! It has been a successful year for the OFHS Forensics program. This past fall, the team earned the National Forensics League’s (NFL) Leading Chapter Award in the North Coast District. This coveted award, based on student participation, is the highest honor the NFL can bestow upon a chapter. Only one school in each district attains this designation each year. This year, out of more than 2,800 NFL member schools nationwide, Olmsted Falls High School is one of only 105 to receive the Leading Chapter Award. Congratulations to our OFHS Forensics Team and their advisor Mr. John Mercer on these outstanding accomplishments! UNDERSTANDING THE MAY 3RD 2.8 P.I. LEVY: WHAT WILL YOUR “YES” VOTE MEAN? • A YES VOTE WILL help lengthen span of time before next operating levy is needed by expanding the District’s ability to handle looming maintenance expenses in older buildings without tapping into limited general fund dollars. PLEASE HELP US SPREAD THE WORD ABOUT THIS CRITICAL LEVY: Any parent or resident interested in hosting an informational, in-home “coffee talk” for a group of 10-15 friends, neighbors and/or family members, please contact Superintendent Dr. Todd Hoadley to schedule. These in-home presentations feature a 15-20 minute Power Point and an opportunity for Q & A with a District Administrator or School Board member. Congratulations to OFHS students Pam Keller and Hayleigh Sanders on being named among just 26 semi-finalists in the third annual Maltz Museum of Jewish Heritage Stop the Hate: Youth Speak Out essay contest. This year more than 1,700 students from 139 schools shared their solutions to stop hatred and discrimination by entering this essay contest. The 26 semi-finalists – including Pam and Hayleigh – are now eligible for $100,000 in scholarship prizes at an Ohio college or university. The 26 student semi-finalists will be narrowed down to ten finalists after a panel of select judges has read their essays. Those finalists will then compete for three college scholarships by giving oral presentations at an awards ceremony on April 10 at Severance Hall. The Stop the Hate: Youth Speak Out essay contest is open to public, private and home schooled students in Cuyahoga, Geauga, Lake, Lorain, Medina, Portage and Summit Counties. Juniors and seniors compete for three, four-year scholarships (one each $50,000, $25,000 and $15,000) to an Ohio college or university; they and younger students also compete for cash prizes, class visits to the Museum and resource materials for their schools. Good luck to both Pam and Hayleigh! Just a reminder that this Saturday, March 12 @ 7:00 pm on TV5, the OFHS Academic Team will make their appearance on Academic Challenge. Members of the A-Team participating are Jim Coury, senior, captain; Mike Coury, senior; and Sohan Vartak, junior. If you can’t watch, you may want to set your DVR/VCR! This is an all-time record setting performance that will make all Bulldogs proud! The Ohio Graduation Test (OGT) will be administered the week of March 14th – 18th. Students must pass all five sections of the test (Reading, Writing, Mathematics, Science and Citizenship) in order to receive an Olmsted Falls High School diploma. All sophomores will be required to report to their assigned homeroom by 7:30 a.m. each day for testing. MIDDLE SCHOOL HOSTS FIRST “FRIENDS OF RACHEL CLUB” MEETING THIS TUESDAY, MARCH 15TH – ALL WELCOME! 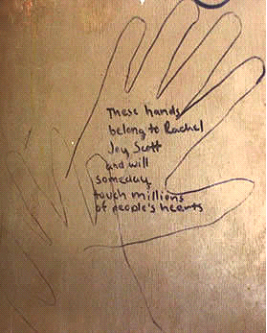 Drawing of Rachel Scott's hands with a message found on the back of her bedroom dresser. Rachel Scott was the first victim of the Columbine High School shootings. 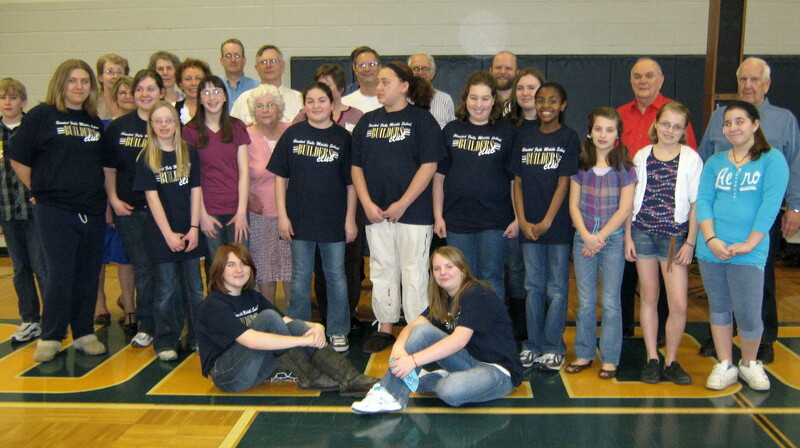 Olmsted Falls Middle School is proud to present the Friends of Rachel Club. This is a club that provides the opportunity for students, staff, and community members to partner with Rachel’s Challenge to continue the chain reaction of kindness and compassion for our school, community, and world. The goal of the Friends of Rachel Club is to encourage everyone to be a helpful friend to anyone who needs a person to care and to comfort him or her. We hope to make a positive impact in schools and communities by sharing Rachel’s message of kindness for others. The Friends of Rachel Club invites all Olmsted Falls community members to its first meeting on Tuesday, March 15, 2011 from 7:00pm – 8:15pm. We will meet in the OFMS Media Center. The Olmsted Falls High School football field has been selected as a winner of the 2010 “Field of Excellence” Award sponsored by Pioneer Athletics. 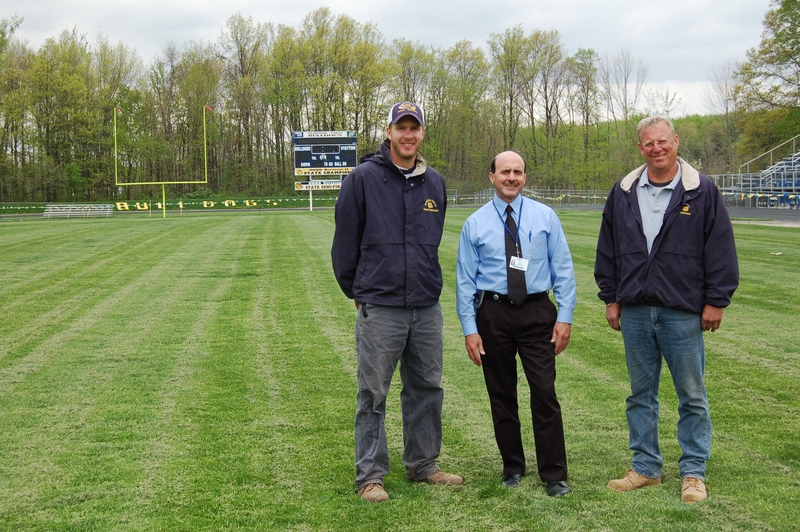 At right, Olmsted Falls School District Director of Business Affairs Tim Atkinson stands between grounds maintenance staff member Heath Krakowiak (left) and grounds maintenance manager Tom Dipert (right), who both received special recognition for their work in maintaining the award-winning field. The OFHS athletic field and crew exhibited the care, dedication, and overall superior qualities that judges were looking for in selecting a winner. This achievement places our field among the best, both professional and amateur alike, in the nation. This is the third consecutive year OFHS has earned this award. Congratulations to senior P.J. Mueller (left) and sophomore Chase DuPratt (right), who placed 8th at the State Tournament last weekend to become the 55th and 56th All-Ohio Wrestlers in school wrestling history. Olmsted Falls has placed 56 Wrestlers in the State Wrestling Championships. That total ranks the Bulldogs 18th in the History of the Ohio State Tournament. For additional information, please visit www.ofwrestling.com. 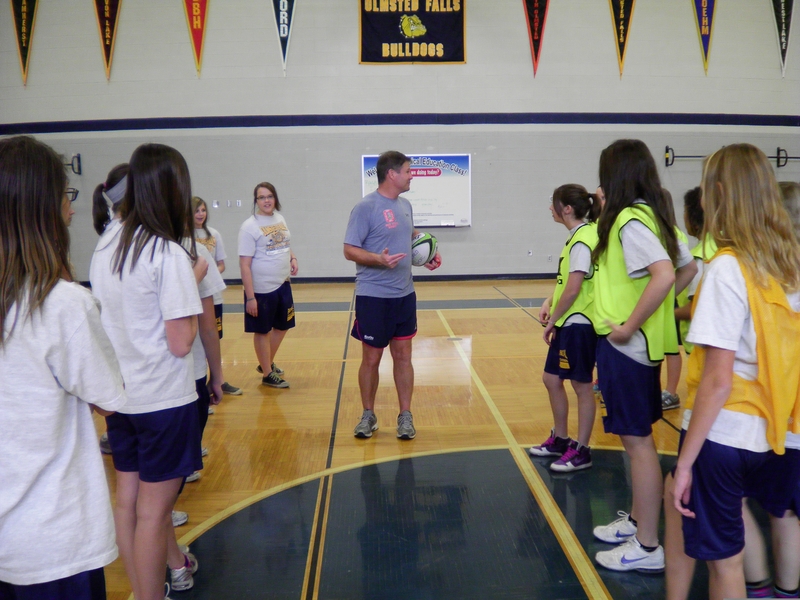 The OFMS Physical Education Department partnered with Ohio State Assistant Rugby Coach Ron Bowers to promote youth non-contact rugby during physical education classes last week. Coach Bowers worked with all of the Middle School students to help develop their rugby skills, as well as the teamwork and leadership aspects of the game. Rugby is the second most popular sport in the world and is played in over 90 countries. Several area high schools, colleges and universities field both men’s and women’s teams. Mrs. Gulden was nominated by OFMS PTA member Denise Olszewski. 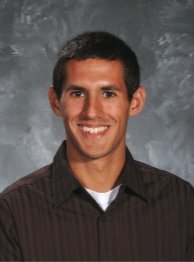 Mr. Tabar was nominated by OFIS PTA member Ann Simon. Congratulations to Mrs. Gulden and Mr. Tabar for inspiring these heartfelt nominations through their commitment and dedication to our students! Each school district may submit one nomination for this prestigious award each year. A vote by PTA Council members at last month’s meeting selected Mrs. Gulden as the nominee to be submitted to compete with the pool of nominees from other local school districts in the area. Congratulations to Mrs. Gulden! OFHS student Hannah Whitney (junior) is a member of Look Up to Cleveland – an organization that promotes Cleveland by having one student from each area high school attend seven one-day meetings throughout the year. Each meeting has a theme and explores a different aspect of the city. 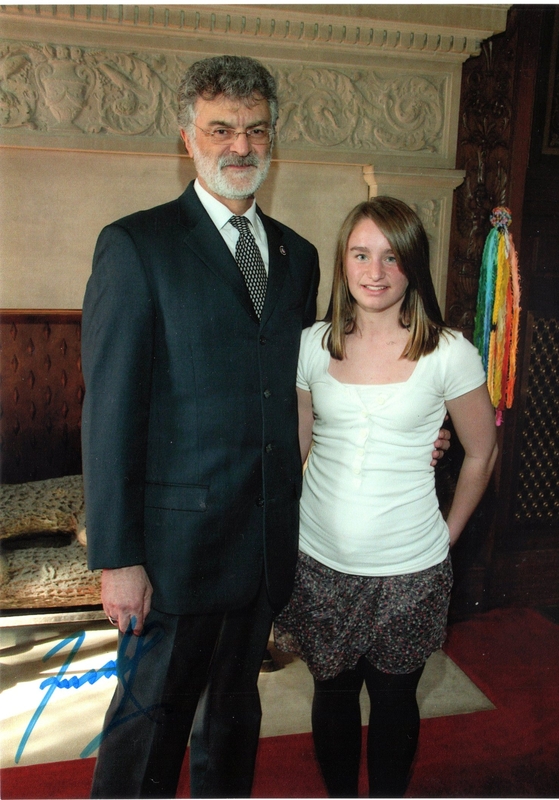 Most recently, Hannah participated in Look Up to Cleveland’s “Government Day” where she met Cleveland Mayor Frank Jackson (see photo at left) as well as the City Council President and a member of the new County Council. Other meeting themes include: “Cultural Day,” where students experienced backstage tours of the Capitol Theater, Hanna Theater, and Near West Side Theater; and “Business Day,” where students met the person who started the entrepreneurship organization, Jump Start. The DanceItUp4Kids Health Event is just around the corner! This family-friendly event will take place Saturday, March 19th from 11 a.m. to 3 p.m. at Olmsted Fall Middle School. Event Tickets: $3 Students/Seniors 60+ & $5 All others. Children under 5 are free. DANCERS STILL NEEDED — OR JUST PEOPLE WHO LIKE TO HAVE FUN & RAISE MONEY FOR A GREAT CAUSE! Dancers are needed for the exhibition which starts at noon. NO SKILL REQUIRED! Just put together a fun, entertaining, family-friendly routine with your friends or family, and come dance to raise money for our kids. Please call Darla at 440-427-6364 to register by March 14th. Dancers of all ages are also needed for the marathon! There are two ways you can dance in the marathon: 1) Bring a completed pledge form (available in the school clinics or contact Darla) to the event & you’ll get in free. You’ll also be eligible for some amazing prizes for the most pledges and the most money raised; OR 2) Come to the event and give a $5 donation at the marathon. Along with the donation, you’ll need to purchase an event ticket at the door. All dancers must have a parent signed release prior to dancing (available in the school clinic or at the event). Marathon info: 11:30 a.m. to 2:30 p.m. (15 minute breaks every hour). Limbo and Hula Hoop Contests for prizes – all dancers eligible. You can stop dancing at any time! Come on O.F.! You could spend over $150 taking your family to the IX Center Amusement Park for a day, OR you could spend well under $40 bringing your family to this amazing event that promotes children’s health, is tax deductible, and raises money for our kids! ARE YOU LOOKING FOR SOME GREAT MOTHER’S OR FATHER’S DAY GIFTS ON A BUDGET? Check out some of our amazing raffle items! – Many more items too numerous to list! The Olmsted Falls Academic Booster Club puts on the Annual Honors Banquet held at Baldwin-Wallace College each year. This important group is seeking Board members to join their efforts for the 2011-2012 school year. Any parents interested in getting involved are encouraged to contact Cindy Kelly at 440-235-0989 or cindykelly@ameritech.net for additional information. Also, all Bulldogs can support the Academic Boosters by dining at Applebee’s on Tuesday, March 22nd. Please click here to download the fundraising flyer! POPULAR OECPTA BARGAIN BONANZA SCHEDULED FOR THIS SATURDAY, MARCH 12TH – Olmsted Early Childhood PTA’s Bargain Bonanza Resale Event is set for Saturday, March 12th in the Olmsted Falls Middle School Cafetorium. Great deals on gently used children’s clothes, toys, gear and maternity wear. Sale times and costs are: Early Bird – 8:00am to 9:00am – $5, General – 9:00am to 12:30pm – $2, Bag Sale – 2:30 pm to 3:30pm – $3 per bag. Please visit www.oecpta.org for more information. HUGE RUMMAGE SALE THIS SATURDAY, MARCH 12TH – Right down the road from the Bargain Bonanza, the Olmsted Falls Relay for Life Rummage Sale will be held from 9:00 a.m. to 1:00 p.m. at Falls-Lenox Elementary School. Hundreds of participants, food, furniture, toys, and clothes! Come and hunt for treasures! All proceeds benefit Olmsted Falls Relay for Life event on June 11-12, 2011. For information, contact Lisa Brady at (216) 870-2856 or Michelle LaGruth at (440) 476-4697. KIWANIS SPONSORED PANCAKE BREAKFAST FOR MACKENNA WERTMAN THIS SUNDAY, MARCH 13TH, 8:00 A.M. TO 1:00 P.M. AT OLMSTED FALLS HIGH SCHOOL – MacKenna Wertman, a 4th grader at the Olmsted Falls Intermediate School, is fighting her second battle with brain cancer in less than 5 years. Since December, MacKenna has endured two rounds of chemotherapy and is on her fifth week of radiation therapy in Indiana. All proceeds from this Sunday’s breakfast will be donated to MacKenna and her family. We hope to see you there – your support means so much! Adults $8.00; Kids Age 10 & Under $4.00; Children Age 2 & Under are FREE. Entertainment for the whole family, plus 50/50 and gift basket raffles. HIGH SCHOOL POST PROM 2011 COMMITTEE FUNDRAISER – WING NIGHT AT SLIM AND CHUBBY’S ON SATURDAY, MARCH 19TH, 6:00 to 9:00 p.m. – Support OFHS Post Prom by enjoying “Wing Night” at Slim and Chubby’s located at 12492 Prospect Road in Strongsville on Saturday, March 19th from 6:00-9:00 p.m. $25 per person. Food, Raffle and Fun! ﻿﻿﻿OLMSTED FALLS ACADEMIC BOOSTERS FUNDRAISER ON TUESDAY, MARCH 22nd from 11am-9pm – ﻿﻿﻿Download and bring this special flyer to Applebees & they’ll donate 15% of your lunch or dinner check to the Academic Booster Club. The Academic Booster Club puts on the Annual Honors Banquet each year at Baldwin-Wallace and would like to give some financial support to the Academic Team in their endeavors as well, so any funds raised will support both. Kindly encourage people to pass on the flyers to friends & co-workers…anyone can participate. PLEASE REMEMBER TO BRING THE FLYER! ﻿﻿﻿﻿﻿EMPLOYERS, JOB SEEKERS INVITED TO 2011 POLARIS/WESTSHORE CAREER FAIR – Wednesday, March 30th, from 10:00 a.m. – 2:00 p.m. – Polaris partner employers and local job seekers are invited to participate in the ﻿﻿﻿2011 Polaris/Westshore Center Career Fair which will be held at the Polaris Career Center on Wednesday, March 30, 2011, from 10:00 a.m. to 2:00 p.m. This free event, designed to foster a competitive and productive workforce in Northeast Ohio, will provide a vital link between employers and potential employees – the career fair promises to attract 100 companies and more than 1,200 job seekers. In addition, local agencies and representatives from Polaris will be on hand providing access to educational resources, financial aid information and much more. Employers must click here to register online. Set-up on March 30 will take place from 8:00 to 9:30 a.m. followed by a brief welcome program. Job seekers are strongly encouraged to pre-register at this web address to gain priority entry into the event. Prior to the March 30 Career Fair, Polaris will host free Resume Writing Workshops on Thursday, March 24 from 1:00 to 3:00 p.m. and 5:00 to 7:00 p.m. These sessions will provide timely resume information and allow participants to “hit the ground running” on March 30. To register for the Workshop, visit www.polaris.edu or call (440) 891-7600. For additional information, contact Tony Schweppe (Employment Connection) 216-664-3431 or Chris Anderson (Polaris Career Center) 440-891-7607 or visit www.polaris.edu. For years, public education has been viewed as an investment into our nation’s future. Over the course of the last two years, during these turbulent times of economic uncertainty, the view of public education has moved away from being “an investment” and now, the value of public education is often labeled as “an expense”. This is a subtle difference, but a very important one. Last evening, NBC news aired a segment on its evening news program about this change in the way public education is viewed. Click here to view this news segment and then we would ask that you submit a comment regarding your views on the concept of public education. Be informed. Ask questions. Get Answers. Please join Superintendent Dr. Todd Hoadley for a brief presentation this coming Monday, March 7th at 7:00 p.m. in the Falls-Lenox Library Media Center. Additionally, if any parent or resident is interested in hosting an informational, in-home “coffee talk” for a group of 10-15 friends, neighbors and/or family members, please contact Superintendent Dr. Todd Hoadley to schedule. These in-home presentations feature a 20 minute Power Point and an opportunity for Q & A with a District Administrator or School Board member. 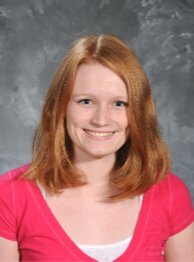 Lora Hirschberg was one of the first National Merit Scholars recognized at Olmsted Falls High School. She also played flute in the Bulldog marching band during her time here. Following her graduation from OFHS in 1981, she attended film school at NYU. During her career, Lora has worked on more than 100 films including “Iron Man,” “Into the Wild,” and “Batman Begins” to name just a few. She currently works with Skywalker Sound (the sound studio of acclaimed director George Lucas) in Northern California. Congratulations to former Bulldog Lora Hirschberg on this outstanding achievement! 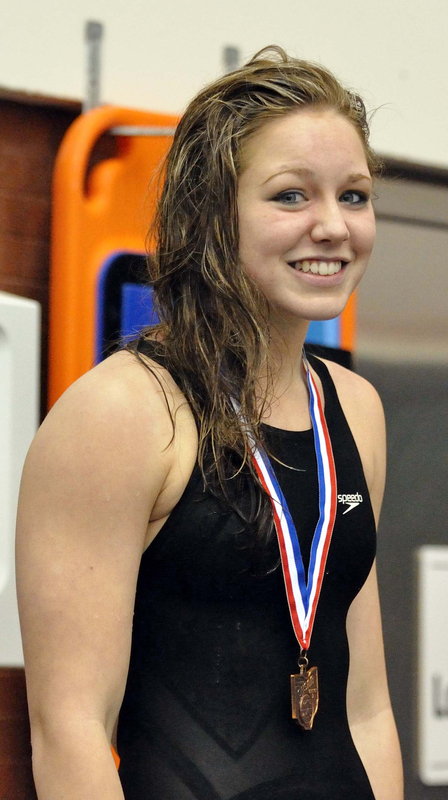 The Olmsted Falls Swim Season came to a close this weekend, as the team made its second consecutive trip down to the Ohio High School State Swimming Championships, which were held at C.T. Branin Natatorium (Canton McKinnley HS). As reported on last week’s blog, senior Amanda Paliska qualified in both her individual events, the 200 Individual Medley, and the 100 Backstroke. The State Meet was a great experience for the Olmsted Falls senior, and the coaching staff. The highlight was the 100 backstroke: Amanda had a great pre-lim time of 59.11, advancing her into the consolation finals. In the consolation finals, she swam a 100 Backstroke time of 58.4, placing her 4th in her heat of 8, and 12th overall in the state (out of 24 state meet qualifiers). Congratulations to Amanda on this outstanding accomplishment! By placing in the consolation finals, Olmsted Falls also scored points for the first time in the state championship swim meet (5pts.). Great ending to a great season! Congratulations to sophomore wrestler Chase DuPratt and senior wrestler P.J. Mueller who have qualified out of the Lorain District to the State Championships to be held at Ohio State this upcoming Thursday through Saturday. After losing in the first round 4-3 to the eventual Champion, P.J. Mueller rallied off 5 straight wins to take a strong 3rd place finish at the District competition. Fellow Bulldog Chase DuPratt lost in the quarter finals 5-1, and rallied back to qualify for State with a thrilling 1-0 victory in triple overtime. Chase then lost a tight 1-0 victory to finish 4th. Good luck to P.J. and Chase as they head to the State Championships later this week! State tournament information can be found at: www.ohsaa.org. For additional information on Bulldog Wrestling, visit: www.ofwrestling.com. Tuesday, March 8th – OFMS PTA @ 7 p.m.
Thursday, March 10th – OECPTA @ 7 p.m.
Tuesday, March 15th – OFIS PTA @ 7 p.m.
Monday, March 21st – OFHS PTA @ 7 p.m.
Tuesday, March 22nd – Falls-Lenox/ECC PTA @ 7 p.m. Please click on any of the PTA units above for additional details. March 4th is “LET IT GO DAY” at Olmsted Falls High School. This Friday, March 4th, students and staff are encouraged to wear something green. Green represents growth and new beginnings. Students will participate in various classroom activities in language arts, social studies and art. The guidance department and administration have worked with these three departments to create special lessons focusing on personal reflection, law and individual expression. 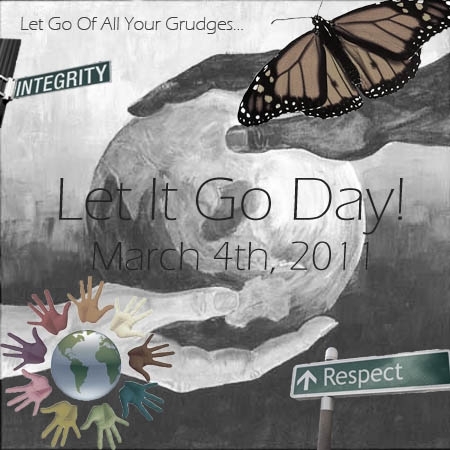 The goal of “LET IT GO DAY” is to actively promote kindness and acceptance in our schools. In anticipation of this special event, a number of “LET IT GO” posters have been designed by students to help promote the event. Above is a poster created by OFHS student Madison Horvath. To view a showcase of additional “LET IT GO” posters, please click here. Are you looking for something fun and worthwhile for your whole family to do? Why not make the DANCE MARATHON (11:30-2:30) a family affair? It’s easy. Pick up a registration/pledge form at any school office. Ask family, friends, co-workers to pledge money for you and every member of your family to dance. Then all you have to do is show up and have a great family day for a worthwhile cause. There will be contests!!! Can you limbo? There will be prizes!!! Wait till you see what the dancer with the most pledges wins! Afraid you’ll poop out? That’s okay – you can stop at any time! No registration or event admission fee for participants with a completed pledge form. If you don’t have a completed pledge sheet, you can join your friends and dance for a $5 donation (sorry, not eligible for prizes). Registration forms available: In all school offices or contact danceitup4kids@gmail.com . Pledges due by April 15th. Late Registrations for the Exhibition Accepted! Come dance on the same stage as our special guests. Contact danceitup4kids@gmail or Darla Haviland at 440-427-6364 for registration information. Polaris partner employers and local job seekers are invited to participate in the 2011 Polaris/Westshore Center Career Fair which will be held at the Polaris Career Center on Wednesday, March 30, 2011, from 10:00 a.m. to 2:00 p.m. This free event, designed to foster a competitive and productive workforce in Northeast Ohio, will provide a vital link between employers and potential employees – the career fair promises to attract 100 companies and more than 1,200 job seekers. In addition, local agencies and representatives from Polaris will be on hand providing access to educational resources, financial aid information and much more. Employers must click here to register online. Set-up on March 30 will take place from 8:00 to 9:30 a.m. followed by a brief welcome program. Job seekers are strongly encouraged to pre-register at this web address to gain priority entry into the event. POPULAR OECPTA BARGAIN BONANZA SCHEDULED FOR SATURDAY, MARCH 12TH – Olmsted Early Childhood PTA’s Bargain Bonanza Resale Event is set for Saturday, March 12th in the Olmsted Falls Middle School Cafetorium. Great deals on gently used children’s clothes, toys, gear and maternity wear. Sale times and costs are: Early Bird – 8:00am to 9:00am – $5, General – 9:00am to 12:30pm – $2, Bag Sale – 2:30pm to 3:30pm – $3 per bag. Visit www.oecpta.org for more information. OLMSTED FALLS ACADEMIC BOOSTERS FUNDRAISER ON TUESDAY, MARCH 22nd from 11am-9pm – Download and bring this special flyer to Applebees & they’ll donate 15% of your lunch or dinner check to the Academic Booster Club. The Academic Booster Club puts on the Annual Honors Banquet each year at Baldwin-Wallace and would like to give some financial support to the Academic Team in their endeavors as well, so any funds raised will support both. Kindly encourage people to pass on the flyers to friends & co-workers…anyone can participate. PLEASE REMEMBER TO BRING THE FLYER!